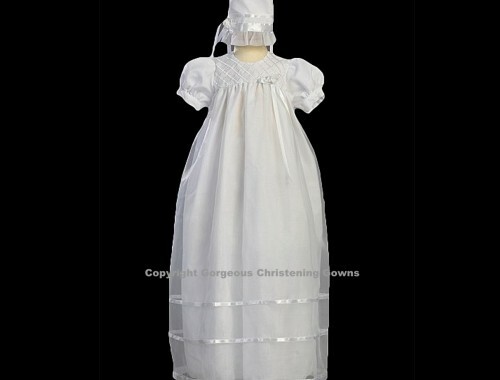 An exceptionally sweet christening gown. This gown features two layers. The skirt is overlaid with organza creating an extremely beautiful multi-dimensional look. 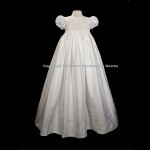 This christening gown is accented with criss cross embroidery at the bodice and finished with satin flower trim. Plus the entire skirt is over layered in organza with three rows of satin ribbon adorning the lower part of the skirt. Features a matching bonnet. 30″ long.